The blog has not been updated in a while, and for that I apologize. Aside from all the craziness in the world around us, it has been incredibly busy with full time work and all that has been going on for the publishing and community front. My attention has been mainly in community and team coordination. For example, we’ve been visioning and growing our team at Wattpad Literary Fiction Network, starting up the second movement of the Cell Phone Novel Network, running contests, interviews, reviews, curating reading lists and more. Our first LitFic contest just ended and on our network, I’m proud to say we have been growing a new demographic and feature some of the most brilliant prose I’ve ever read – work that deserves not only to be published but to go down in history. Our vision is to bridge the old and the new, the traditional and digital, and carve out new publishing and writing opportunities and start a dialogue on technology for aspiring and established authors, publishers, journals and more. I am also running a team for a huge Wattpad anthology event featuring ten (eleven) themed teams of ten writers, ten stories, each. This party will also be a big debut for the Literary Fiction Network and Cell Phone Novel Movement. You can check out our team’s introduction. In other news, Inspiritus Press is working on a chapbook of experimental poetry and prose with a theme of the body as a channel for metaphysical experiences slated to be released in January. Our team in Toronto has been attending events and getting to know the local Canadian publishing industry, such as all the brilliant small indie presses and literary journals in Toronto. It’s such a warm and passionate community out there. A quick note: you should definitely check out Knife Fork Book at Rick’s Cafe in Kensington Market, Toronto, if you’re in town. I am also now officially a Wattpad Star and get to join the family of the top writers and work with Wattpad staff and the industry. Espresso Love is also being considered by agents and publishers and I am praying and crossing fingers once again. To stay most updated, the easiest way is to follow us on social media such as our Twitter accounts @takawrites @WattpadLitFic @InspiritusPress @YUCrossroads and my Facebook page. There will be a lot of developments coming soon. All in all, out of all that’s going on, there are many grand visions still in their beginning stages and I’ll update more when I get back into the habit of writing blogs and there is more significant news to report. But at the moment, I want to turn my focus on one of the most exciting developments, which is the inaugural YU Crossroads Literary & Reading Festival. Here is the first look at our event poster and some of our VIPs. 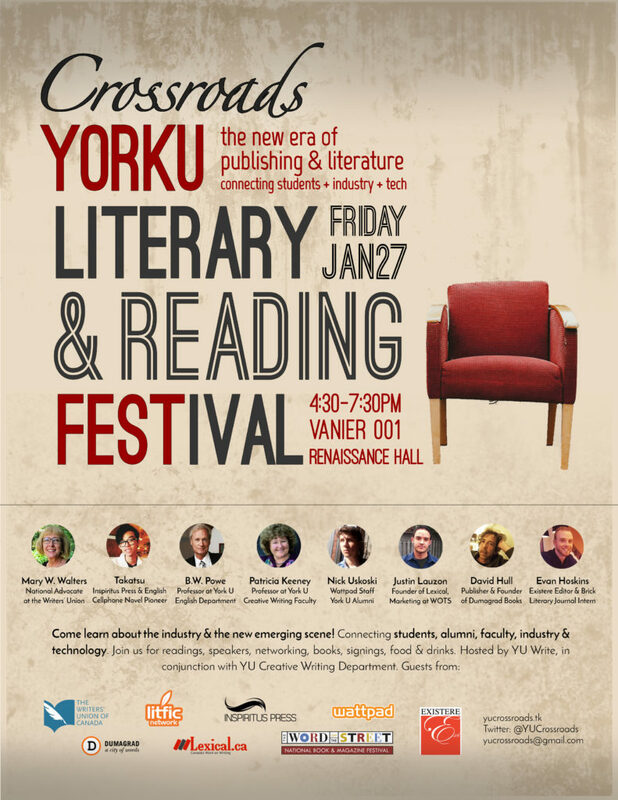 So come out and join us on Jan 27 4PM for an amazing literary and reading festival at York University Vanier College 001 Renaissance Hall with a vision to connect students, alumni, faculty, industry and new emerging publishing trends and technology. There will be readings, speakers, networking, books, signings, food and drinks. Guests from the York University Creative Writing faculty, Wattpad, The Writers’ Union of Canada, Word on the Street, untethered Mag, Existere Journal, Brick, A Literary Journal, Dumagrad Books, Inspiritus Press, and the Wattpad Literary Fiction Network.